I will be the first to admit that I was never a big fan of zucchini, there didn’t seem to be much of a taste to it and the consistency was always a little too squishy. I do like it however, as an option for a healthy pasta. For me personally, the high content of magnesium is what draws me to this special veggie, magnesium is crucial to muscle contraction. This essential mineral supports the proteins abundant in your muscle fibers, which in turn helps to relieve my restless leg syndrome that keeps me up all nite. Zucchini also is high in two unique antioxidants, lutein and zeaxanthin. These two phytonutrients are necessary to keep eyes healthy and help to prevent macular degeneration and cataracts in later life. The omega 3’s present in zucchini help to fight inflammation, potassium aids in regulating blood pressure, phosphorus to keep bones strong and every cell in our body healthy. Copper reduces blood cholesterol levels and plays pivotal role in energy production, zinc promotes healthy skin and immune system. Scientists have linked a number of skin related issues like acne and canker sores to low levels of zinc in diets. Niacin or B3 is essential to the body for energy production by converting fats, carbs and protein into usable and stored energy. B3 also helps to protect the body from dangerous free radicals that can cause damage to tissue. Calcium, as we all know, is critical to bone health and osteoporosis prevention, but, calcium also aids in keeping our acid/alkaline blood levels balanced. On the days that not enough calcium is ingested through food, the body then has to borrow calcium from inside the bones to make up the difference. This give and take generally isn’t dangerous to your overall bone health unless you are not maintaining and replenishing calcium levels on a regular basis. Vitamin K is responsible for the blood clotting that occurs within the body, which is a necessary function when we cut ourselves. Vitamin K also helps to keep bones healthy and strong, as well as being scientifically studied for its ability to protect the cells lining veins and arteries. Zucchini is a great vegetable to add to your diet to promote optimal health for yourself. 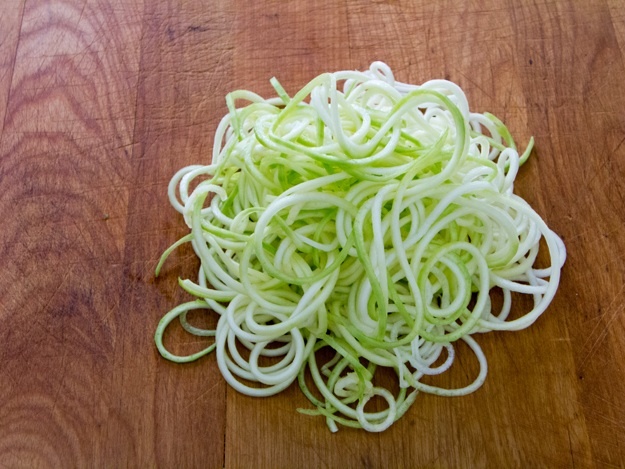 It’s so easy you don’t even have to cook it, eat it raw with dips or in salads or you can try something new and create your own super tasty zucchini pasta.